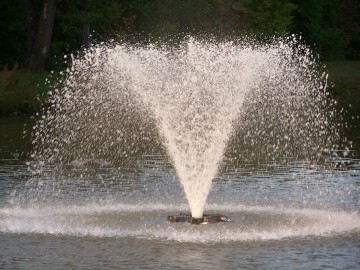 A fountain pump takes care of the water in your pond spouting up and it is also suitable to be used for a water ornament. A fountain provides a larger extent of perception to your pond and garden. Plenty fountains can be found in public municipal parks, on squares and buildings and using a fountain pump also in your pond at home! How does a fountain pump work? A pump in your pond fountain or water ornament will pump the water around various forms or simply upwards also you can decide the height and the way of spouting. There are different spraying heads, like a foam nozzle, a water bubble or a fountainhead. Fortunately you do not need a pond if you like a fountain. A gravel bed or a water basin may provide accommodation to a splashing fountain. You can also purchase beautiful terrace fountains or water ornaments, which you can place anywhere in and around your house. If you choose a fountain pump the best thing to do is that you find out beforehand how high you want the fountain to spout. Not each fountain will reach the same height. Fortunately the height is indicated on the packing. As the pump is underwater, it is important that you buy a durable pump. You do not want to bring it to the surface each time for maintenance purposes. You should purchase a low energy pump , which is maintenance friendly. In this way you can enjoy the fountain longest and you do not have any problem with it! It is not difficult to connect a fountain pump. If you purchase a quality pump, a clear and useful manual will always accompany it.